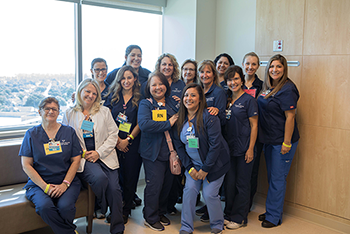 Week 3 of training and moving in to our new Community Memorial Hospital Ocean Tower in Ventura was significant, as we prepared for and took part in our first “Day in the Life” training exercise in the new building! Over 300 staff, physicians, and volunteers gathered for our first “Day in the Life” training event. 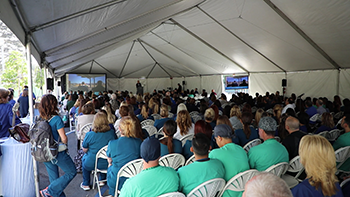 Led by our highly specialized transition team, HTS, the “Day in the Life” event gathered over 300 staff, physicians, administrators, and volunteers for a full activation of the new building. The day kicked off with breakfast and a morning briefing in a large tent just off the new Ocean Tower Cafe Terrace, before moving into the new hospital for a number of training scenarios in patient care and support areas throughout the facility. These scenarios were designed to familiarize our staff and physicians with their new departments, test some policies and procedures, and identify potential challenges. “Issues Recorders” were present in every scenario to help document the challenges encountered and questions raised by the team members participating in the exercise. Clinical teams and support departments had a chance to familiarize themselves with their new areas and activate new procedures. Staff and physicians practiced treating volunteer “patients” who presented with a variety of symptoms and conditions, while members of our Environmental Services, Transport, Hospital Admissions, Nutrition Services, and Information Technology teams activated their areas and practiced providing support to the clinical teams. Our Electrophysiology team, Imaging team, Stat Lab, and Surgical teams also took part in important scenarios in their areas. We have a few more “Day in the Life” events scheduled before we open to patients and the public this winter. We want to send a huge THANK YOU out to everyone who volunteered their time for this first training exercise – we couldn’t have done it without you!